On the front of a paper plate, draw, color, and cut out a whale and water spout, as shown. 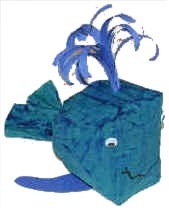 Make a fin from the scraps. Glue it on. Place the whale on the back of another plate, lining them up at the bottom. Trace around the tail fin, and cut out a section above and below it as shown, making another tail fin. Color the second tail fin, water, and sky. Glue together the center parts of the two plates. When the glue dries, bend back the bottom edges, and stand the plates up. If necessary, tape a scrap on the back below the whale’s tail for balance. This is a classic craft that we've likely all made when we were young. It continues to be loads of fun for the kids! Scrunch the top together and wrap an elastic band or masking tape around to seal. The stuffed part is the body of the whale. The end (top of the bag) is the tail. Scotch tape or glue the flippers to the paper bag (I usually glue them to the tummy). You can poke a hole in the top of the bag with a pencil and squish the bottom of the spout in there and then apply scotch tape as needed. Use a black marker to draw on eyes and a nose (or use wiggly eyes or round stickers). Fold two opposite side over so that they meet at the fold. Fold the tip over to just meet the other folds. Fold the piece in half along the central axis. Make a short cut through the end of the fold in the tail. Fold the edges of the tail outwards. Draw eyes, fins, and any other patterns you like, and enjoy your whale.